Time Crisis is a light gun based arcade game that was released in 1995. It was similar to other popular light gun games of the time, including games like Virtua Cop and The House of The Dead. However, Time Crisis did have a couple of unique features that made it stand out. 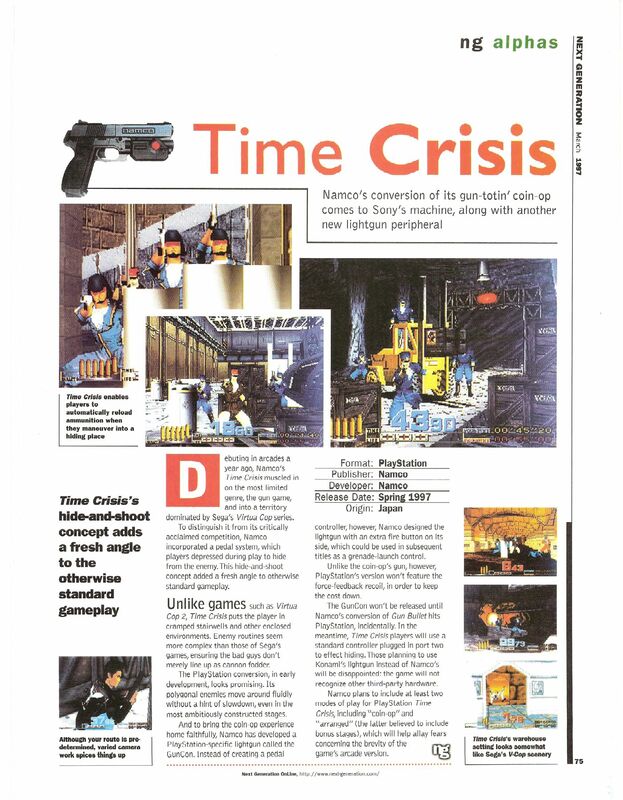 The most unique part of Time Crisis was its emphasis on taking cover. The arcade version of this game had a foot pedal that was used to duck behind various objects. Being hit with a bullet while not taking cover cost you a life so this was an important part of the game. However, your time was limited so you couldn’t exactly spend as long as you want hiding. Another unique feature of the arcade version of the game was that the gun simulated recoil adding a bit of realism. The plot is somewhat convoluted but the important part is that you have to run around and shoot stuff. The PlayStation version of the game was released in 1997 and included the Guncon light gun controller. While not quite as graphically impressive as its arcade counterpart, it was still a good port. The PlayStation port retained the importance of taking cover but the foot pedal was replaced by a button on the controller. Unfortunately, the recoil feature was left out but it isn’t really that big of a deal. Original hardware is still the best way to play this game, and that includes a CRT based TV if you are going to play the PlayStation version as the original Guncon controller won’t work with LCD based TVs. This is one limitation that makes playing older light gun based games via emulation less than perfect. The image up top is from the March 1997 issue of Next Generation and features a preview of the unfinished game on the PlayStation. Screenshots above are from the PlayStation version of the game.